Claburn’s highly instrumental use of her voice is… riveting to hear… This is one of the most auspicious recording debuts for a jazz singer I’ve heard… Highly recommended. When a second daughter came along in 2002, music once again took a back seat to family. But it wouldn’t last long. By early 2005, Andrea was back at the Jazzschool, studying improvisation with Suzanne Pittson, now the chair of the CCNY music department and a leading vocal jazz educator. 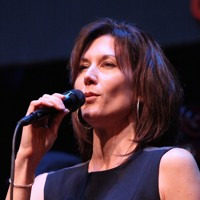 Andrea started gigging professionally in 2006 and made the rounds of local venues over the next few years, rapidly gaining confidence as a bandleader and performer and forming connections in the jazz community. “Our talent pool in the Bay is so deep – the east coast-centric music media often overlook world-class players here.” When the Jazzschool (now the California Jazz Conservatory) launched a degree program in 2009, she felt it was the perfect opportunity to take her career to another level. “There was so much I wanted to say musically that I didn’t feel I had the chops to do yet, and the faculty there is second to none.” At the CJC, Andrea studied with west coast jazz luminaries including Laurie Antonioli, John Gove, John Santos, Marcos Silva, Jeff Denson, Mike Zilber, Erik Jekabson, Anthony Brown, and CJC founder and president, pianist Susan Muscarella. At the beginning of her second year, she was awarded the Mark Murphy Vocal Scholarship, an honor bestowed on a student who demonstrates “exceptional creativity and artistic promise.” Graduating with a B.Mus in 2015, the wealth of compositions and arrangements she had put together during her years at the CJC – as well as a call list of outstanding instrumentalists she had gotten to know along the way – gave her ample material for a full-length recording. In January, 2016 she went into Fantasy Studios with a group of top-tier players to record her debut album, Nightshade. 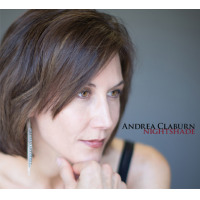 The songs on Nightshade capture Andrea’s eclectic musical sensibility while remaining squarely in the jazz idiom. As sole producer and arranger, she assembled a band that could expand and contract as each arrangement required. As a result, the album has both instrumental variety and a cohesive sound. Featuring an all-star lineup of Bay Area players including Matt Clark, Sam Bevan, Alan Hall, Terrence Brewer, Erik Jekabson, and John Santos, the songs are wide-ranging and adventurous, including a four-horn arrangement of her original My Favorite Flavor, and the unusual combination of string quartet, guitar, bass, and percussion on Steal Away. “I’m a little obsessive... I labor over compositions and arrangements forever. I read once that Monk did that with his melodies, and now I totally get it. It’s about creating something that’s interesting and tuneful but making it sound effortless, as if melody just springs from the harmony naturally.” Her family is one source of compositional inspiration: Lionheart was written for her younger daughter, Natalia, and Colors of Light for her eldest, Catherine. My Favorite Flavor, with its strong NOLA groove, is an ode to the art form she loves: “My organizing metaphor when I sat down to write it was: if jazz were a man, what kind of a song would I write to describe him?” The Fall of Man, a cautionary tale about desire and betrayal, evokes a classic swing-era standard but with a darkly modern edge. The last song on the album, Steal Away, is the outlier: composed as an elegy to Claburn’s parents, who died 18 months apart in 2009 and 2010, the song is wistful with a palpable melancholy and unexpected instrumentation. “It’s a meditation on memory, loss, and the ephemeral nature of existence. It’s meant to keep you slightly off–kilter, with 10- bar A sections and a tri-tone at the end of the melodic line. My arrangement features a string quartet, and I was thrilled to have great string players for the recording.” Grammy award-winning violinist Mads Tolling layered both violin and viola parts, and Joseph Hébert, Assistant Principal cello of the Oakland Symphony Orchestra, played cello. Nightshade also features a composition by Marcus Shelby, one of the Bay Area’s most prominent bandleaders and composers, the jazz waltz Daybreak (original title Blue Monday), and guitar great Pat Metheny’s Timeline appears in lyric version as Bird on a Wire; Andrea wrote the lyrics to both songs. • Bachelor of Music, California Jazz Conservatory. • Bachelor of Arts, University of California, Berkeley. • Vocal Faculty, California Jazz Conservatory and Jazzschool Community Music School, Berkeley, CA. • Private vocal studio, San Francisco, CA. Areas of expertise as an educator include:vocal technique; improvisation; performance and interpretation; charts and arranging; music theory and notation. Available time slots and hourly rates for private and semi-private lessons available upon request. All About Jazz musician pages are maintained by musicians, publicists and trusted members like you. Interested? Tell us why you would like to improve the Andrea Claburn musician page.